After meetings with the Trump administration last month, leaders of historically black colleges and universities expressed cautious optimism that the increased funding they requested might actually make it into the White House budget. It did not. 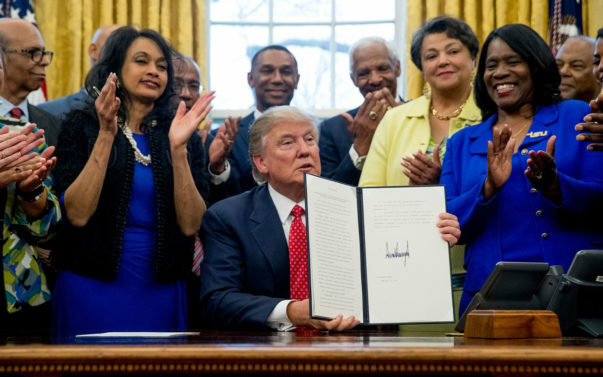 Instead, Trump’s first presidential budget released Thursday calls for “maintaining” $492 million in appropriations for HBCUs and minority-serving institutions. Combined discretionary spending for those schools, however, is actually $577 million right now. The White House directed questions about the discrepancy to the Education Department, which did not respond to requests for comment. There is no mention in the budget of any federal investment in scholarships, technology or campus infrastructure for historically black colleges that leaders requested. And instead of expanding Pell grants for low-income students to cover summer courses as they had asked, the budget raids nearly $4 billion from the program’s reserves. “Less than three weeks ago, this administration claimed it is a priority to advocate for HBCUs but, after viewing this budget proposal, those calls ring hollow,” Rep. Alama Adams (D-N.C.), a graduate of the largest HBCU, North Carolina A&T State University, said in a statement.